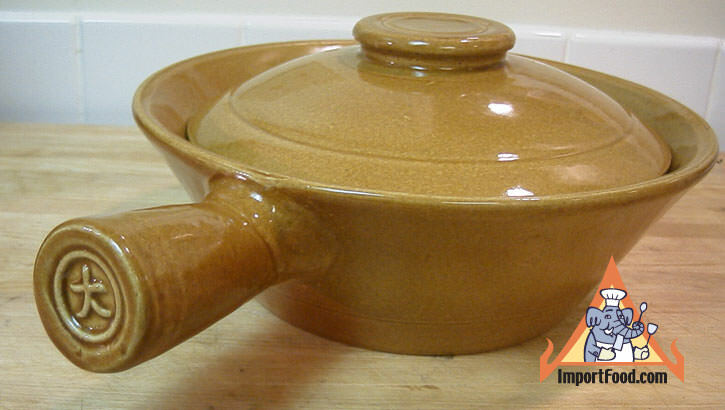 Here we have a style of pot that many customers have requested over the years, and we finally have in stock. The claypot style of cooking is often found in Thai-Chinese restaurants. In Thai this pot is known as a "sharkfin pot" but it's used for any soup. Many consider sharkfin soup not ethical. The pot has a unique design that you won't find in stores, and it offers good functionality. We offer two slightly different styles. The first design is the larger 10 inch clay pot. The glaze is earthy brown, medium gloss. The bottom (underside) is unglazed, natural clay. The pot is 10" across the top, the domed lid is 8" across, the handle is 3" long, and the pot has a 5 cup capacity. With thick sides and solid overall quality, it weighs more than you might expect--over five pounds. Oven-ready, use it to make any casserole. Made by hand, the lid doesn't seat perfectly thus allowing some air flow while baking. A nice gift idea for a chef who enjoys something new. Product of Thailand. Baking these noodles in an authentic Thai clay pot gives everything a nice flavor and beautiful presentation. Use a bit less ginger if you prefer but don't leave it out entirely. We like making this with less chicken and ham, and the noodles can be anything of your choice such as bean thread noodles or rice vermicelli. This is a tasty baked rice that you might find in a fancy Thai-Chinese restaurant. We like how the chicken and ham blend with the rest of the flavors, but you can omit the meat or use less. Use the vegetables of your choice. 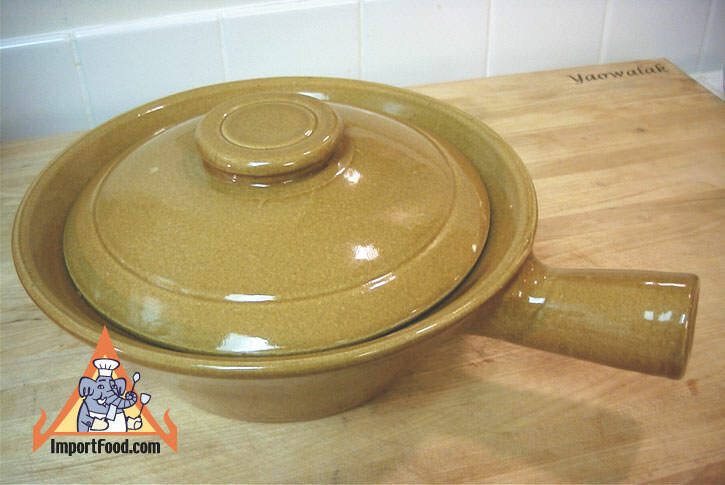 To make this dish we used the authentic Thai clay pot as shown, and that really does enhance the flavor because the lid allows slight airflow. We heated the clay pot in the oven before adding the rice also.